When we think Prithviraj Chauhan, we think of the fabled king immortalised through Chand Bardai‘s Prithviraj Raso that has survived through centuries to tell us about the larger than the life Rai Pithora – of his courage and bravery, his valour in battles that drove Mohammed Ghori back 21 times, his daredevilry in taking Sanyukta away from under the eyes of the kings from all over India present at her swayamwar and his immaculate marksmanship as an archer that killed Mohammed Ghori in his own sabha. Although the Prithviraj Raso available today is mostly in Brijbhasha, the latest traceable copies go to the fifteenth century and hence it is understandable that a lot of what it says about Prithviraj Chauhan III – 1166 to 1192 C.E.- is what constitutes the legend and not an entirely accurate historical account. Various other historical resources including Prithviraj Vijaya and the accounts of battles of Tarain only end up muddying the waters a bit more. And so, this charismatic king’s unbelievably short life of 26 years keeps inspiring numerous recounting, one of the latest being Anuja Chandramouli‘s Prithviraj Chauhan: The Emperor of Hearts, which we had the opportunity to read recently and here we are sharing our views and thoughts on it. My boy will be the greatest of kings. A mighty warrior. A lion among men and as such will be entitled to the king’s share of success, prosperity and happiness. He will shine with the brilliance of a thousand suns. His name will live forever. So it shall be. The flame in his soul is destined to burn for as long as his lion’s heart can bear it. Blessed as he is with the tejas of the divine, he will shine brightest when he makes the ascent to the pinnacle of glory, just before his swift descent to darkness and the depths of abject failure. For so it must be. We meet the branch of Chahman family that is for all intents and purposes living in an exile in Gurjardesha. To give you a bit of background, the Chalukya emperor Siddharaj Jaysingh (who is also a stuff of legends and folklore in Gujarat), had a daughter named Kanchandevi. Since Jaysingh didn’t have any sons, Kanchandevi had been raised like a son and possesses very good governing ability in addition to a fierce intelligence. She was married to Arnoraj, who succeeded on the throne of Ajmer after his father Ajayraj II who founded the city. However, her rival queen Johiyani Sadhava was intent on making sure that her sons Jaggadeva and Vigrahraj IV should be the next kings and Kanchandevi had to flee Ajmer in order to protect her young sons – Someshwara and Kanha. She took refuge in her father’s kingdom that was being governed by Maharaj Kumarpal by that time. Here the boys grew up and Someshwar married Karpurdevi, the Chedi princess from Tripuri and now she is expecting their first child. Like most women of the time, Karpurdevi is disillusioned in her husband and focuses all her love and hopes in this coming child. When the boy is born, he is already expected to be the conqueror of the world and is aptly named – PrithviRaj – ruler of the Earth. As time goes by, Karpurdevi learns of the history of the family feuds, the political undercurrents and shifting alliances of the reigning kings in the neighbouring areas of Central and North -West India comprising of the Chalukyas, Chahmanas, Parmars, Chandels and various small branches of these dynasties. The book shifts between how the young prince’s life is being shaped through being educated with his younger brother Hariraj and young boys from other Rajput families who will be his lifelong supporters and the ongoing battles and transitory regal landscape of India around them as time passes and Prithviraj grows. Their paternal uncle VigrahRaj abdicated the throne due to a life-threatening illness and after the death of his young sons, Someshwara is called back to Ajmer to become the king of Chahmans, making Prithviraj the crown prince. Prithviraj excels in his education as a mighty warrior with a promise to exceed even his mother and grandmother’s expectations of him. His father Someshwara is painted as a weak and indulgent man throughout the book and he dies in the battle with Chalukyas when Prithviraj is still a minor. His mother Karpuradevi becomes the queen regent and holds the kingdom together until Prithviraj can take over. Eventually, he does take over and with unflinchingly loyal support from his uncle Kanha and the cleverness of his mantri Kadambvas learns the ropes of ruling a kingdom quite quickly. Meanwhile, the wars seem to be always knocking on his doors as he taken on and wins battle after battle with his uncle Nagarjuna and other feudal lords but never losing his final target. His biggest ambition in life is to protect Aryavarta from the invading Turukshas. Prithviraj grew up listening to the stories of barbaric invasions of Indian heartlands by Mahmud Gazhni and now the same threat is coming from another Mahmud – this time from the Ghurs. He needs to vanquish this Ravana to finish his allegory to be the Rama of Aryavarta. But in his personal life, he has found heartbreak in form of losing Yogita whom he rescued from a fate worse than death, only to have a few happy months filled with the bliss of first love until she is sent away by his family. He has since rebelled against his mother, his teachers and life in general only to come to terms with it and go on. He marries Padmavati and becomes fond of her. Just when he seems to have become an inhuman tyrant in the battle against the Chandels to gain a victory, his son Govindraj is born. His cup seems to be full. And then the biggest, fiercest battle of his life comes along, where he unites the kingdoms of North and central India and defeats Shiabuddin Ghori. Rumours have it that he is dead, but he isn’t. He is busy recruiting even a bigger army to lead another battle at Tarain. And here in this last few chapters, the story of Sanyukta is told. However, it is left to the readers’ imagination to decide how much of it is fiction written by Prithviraj’s friend Jay and how much is real. Nevertheless, the outcome is that the Prithviraj going in the second battle is a man weakened by excessive joy and excessive pain. He is past the peak of his life and this second battle of Tarain is well and truly the end. 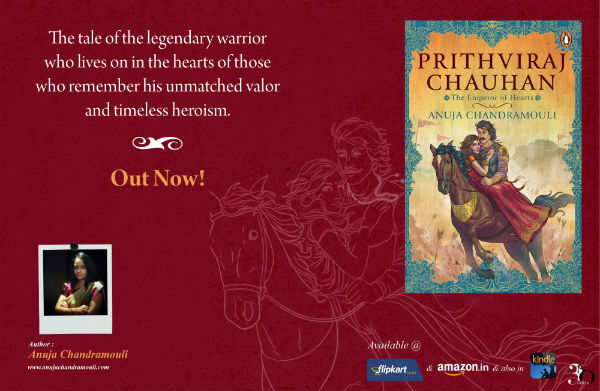 Compared to Kartikeya and Padmavati reviewed earlier, Prithviraj Chauhan is a bigger, larger scaled novel where the story-telling skills of Anuja Chandramouli are on full display. She takes us through not only Prithvi’s life, but that of his family and friends with each character displaying strengths and weaknesses in details. She makes it clear at many places how each king or hero can go on succeeding only with the foundations laid by those who love and worship him throughout his life – despite his flaws. It takes more than just charisma of one person to create and rule a kingdom. As you know, there was a clash between Maharaj Kumarpal and the pretender Chahad after the passing away of my dear father. The latter was the son of one of Maharaj Jaisingh’s ministers and had the temerity to claim that my father had named him the successor to the throne. Naturally, I could not support such a spurious claim! However, my husband did not care for my views and supported him. Maharaj Kumarpal smashed Chahad and his supporters, including the Chauhans, at Abu. Determined to avenge his humiliation, my lord joined hands with Bhallal, the chief of Malwa, and tried yet again to install Chahad on the throne of Anhilwara Patan, unmindful that his life had been spared by the man he sought to destroy and that he was putting Someshwar at peril with his ill-conceived schemes. Needless to say, it was a disaster and Maharaj Arnoraj was bested by Maharaj Kumarpal in single combat. Gracious in victory, he spared your father-in-law’s life. We are good enough friends and even married into each other’s families when we were not hell-bent on fighting each other to death. Vigraharaj-II of the Chahamanas rose to fame when he defeated the Chalukyan Mularaj. Even your great grandfather Jaisingh fought the Chauhans and managed to draw blood before making up with them. Another good addition would be a few maps of India at that time indicating the locations of various kingdoms and marking the battlegrounds. There are a few instances of inconsistencies in the way names are spelled, and some of these are different from their widely accepted versions, but none of these take away from the pleasure of reading. The book is quite detail oriented and the descriptions of marches, travels and especially the various battles are done with a lot of panache. The quotes and words of wisdom are spread throughout them drawing on the same theme we have noticed before in Padmavati regarding the twisted nature of traitors, need for acceptance of all faiths and the innate futility of wars. In an interesting fictional turn of events, Saint Muinuddin Chishti is shown visiting Prithviraj. They discuss the religious messages of peace and Prithviraj promises to treat all his subjects with fairness irrespective of their religions. They discuss religious taxation very like the Jizya tax imposed by Mughal emperors that came later. Considering the huge influence of Khwaja Muinuddin Chishti and his dargah in Ajmer that even today provides the message of peace to people of all faiths from all over the world, this little section is quite apt and fitting into the story. As we have noticed before, there is always a realistic line of thought present in Anuja Chandramouli’s views on love and romance in human life and that’s what makes the little segment on Sanyukta sound more imaginative than real. Usually the historical fiction based in old kingdoms portray women as only the tools – either for pleasure or assassination. This book differs from that tradition as Anuja gives us not one, but two strong matriarchs who form Prithviraj’s life – and there is nothing romantic about their lives. These are women who recognize the weaknesses in men around them, and in some ways become even more tyrannical to make up for it. From his earliest days, he was taught that the only thing that mattered was heroism and the pursuit of glory. Courage was the only quality that defined a real man, who must resist pain and be willing to sacrifice everything, including his life for honour. You will learn to live your life in keeping with the rules of dharma, the moral compass that should be the guide man relies on as he journeys through the terrain of life; artha, which is the art of possessing without becoming possessed; and kama, the experience of pleasure with moderation. By adhering to trivarga—the three-fold path—it is to be hoped that you will someday achieve moksha, which is the path to enlightenment. Fate is blind and nobody is exempt from its vagaries. Before they came here, these people could have been living a good life, chiefs of their tribes, nobility belonging to royal families even, before fate decreed that they should end their lives here. A lot of them are the victims of malice and envy directed at them by others more deserving of a fate like this. It is the way the world works. The truth is that when push comes to shove, we will not give up our wealth so easily. And they will fight to survive, for a better life, if not for themselves then for their young ones. In the meantime, as long as it suits us, we will look away from their suffering. Someday, there will be change but you know…the more things change, the more they stay the same. On the journey of life, you meet a lot of people. Some make more of an impact than others. You never know who is going to be with you till the very end and who is destined to leave you halfway. It is not in your hands, in the end, you just have to be grateful for whatever time you have with those who matter in some way or the other. Though the working of destiny is mysterious and unknow to us, there are still some things very much in our control in the time given to us. The starting and ending of your journey has been decided but how you get there and the means employed must be decided by you alone. Those who give themselves over to violence and embrace its destructive power can never hope to win, irrespective of the side they represent. By its very nature, war cannot yield victory or happiness, in its wake there is never anything but sorrow and suffering. There is no cause that justifies violence and no conquest has any meaning when the price is suffering the infliction of pain. In the end, I am no different from my enemy. I too destroyed my enemies without caring about those who were sacrificed along the way. All in all, an impressive feat of work worth reading. And at the end of the day, as Prithviraj himself says in the book; what does it matter how an account is told. He may not have been a perfect man or a perfect king, but he did achieve an immortalized state in the hearts of Indian people. His fame is only increasing as every few years his story is also retold through television series.